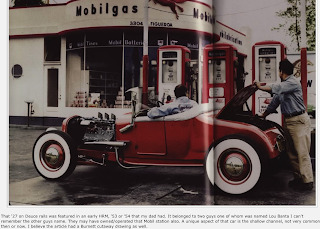 These are a few of my favorite roadster photos I've collected from the web. I've used them to help me, along with some old publications, as inspirational material for my latest build. Click on any picture to zoom in. All of these cars were build in local garages for local events. I doubt any were build by full-time professional 'car builders'. These builders were your local shop mechanics, that could modify & tune their cars while servicing his neighborhood clientele. In future posts, I hope you'll see some of the best elements of these cars adapted into my very own T roadster-racer. 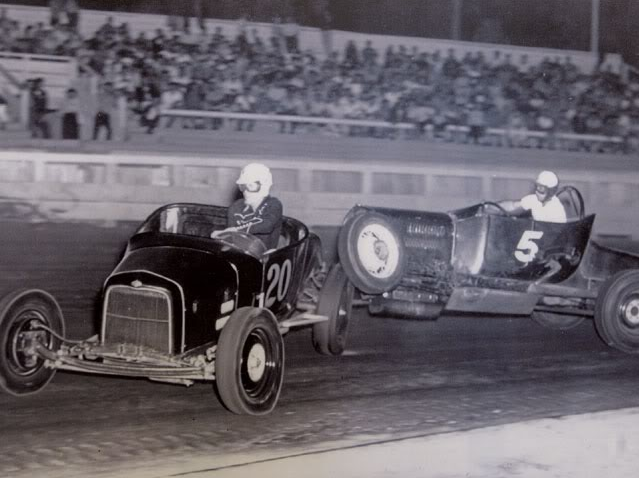 One of my favorites is the photo above; two Ts battling it out before packed grandstands. A common event in some parts, especially in California. Driving up on a competitors tires was unfortunate, and extremely dangerous to say the least. I'd hate to have a tire hit me in the back of the neck! I'd just have to say, I'm in love with that T above with the hood & deuce grill! So simple looking, almost toy like. 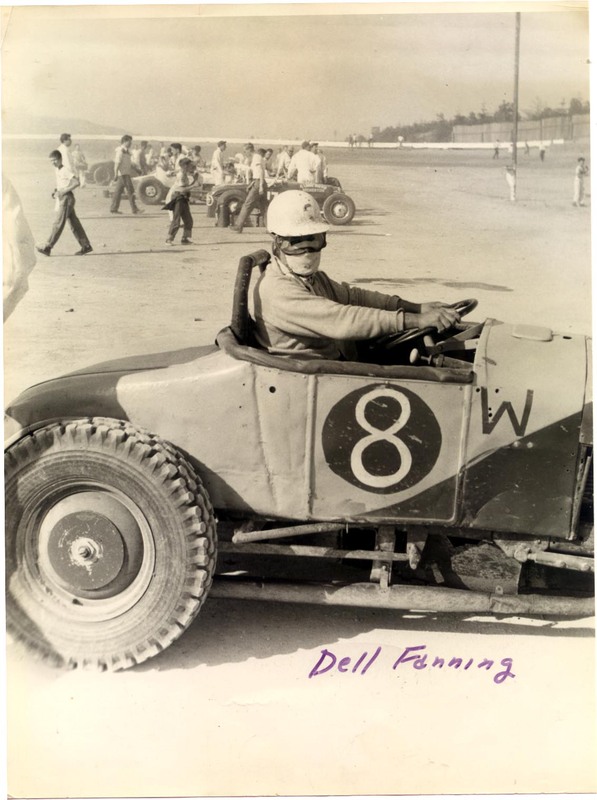 This is another favorite, Phil Weiand's T. Driven at race tracks all over LA as well at El Mirage dry lake bed. It was painted gold (I like gold...) with chromed wheels which was rare for the 50's. The engine is set back for better weight distribution, with a suicide front end, and a belly pan. Pieces of bumper bolted to the rear radius arms as smooth tire deflectors. 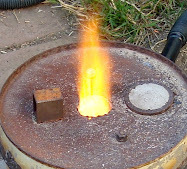 This one is similar to Weiand's. But this time driver/owner is unknown. I like the stock type hood, looks great with the 32 grill, and this one visibly has a deuce frame as well. A very clean looking car. The exhaust is under this car, it changes the look of the car a lot from Phil's above. Here is another 26/27 T, although not in great shape. I like this car because I thought I'd use a rear bumper bar like this. It's simple, yet serves a purpose. Check out the hand grooved tires --for dirt track traction. 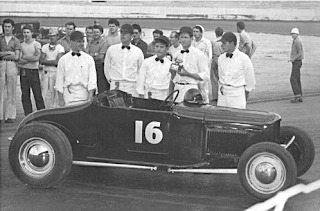 This car was driven by Ike Hanks. It's another Model T, pretty basic, it's made of parts commonly found at any wrecking yard of the time. Here you get a better look at a suicide front end or 'bulldog' perch. Rolled-tube Nerf bumper bars in front & on the rear radius arms. 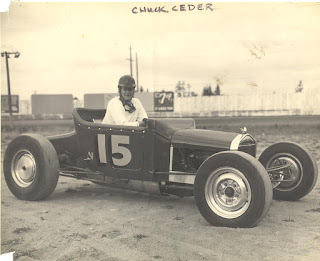 Although the driver in the above picture is named Hanks, the driver in this photo (Chuck Ceder) has a striking resemblance to one actor named Tom Hanks. Don't you think? Click on the picture for a better look. I added this picture because the car is so rough looking I had to show it. To a lot of guys it was only important that the car ran. In fact I've seen some rougher cars, this one is a '27 T roadster welded together. His rear tire looks as tall as the one on my car. 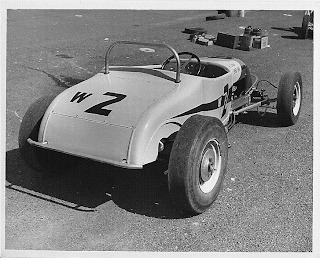 Another '27 T, and it seems this car has seen some action! It has a pretty well used Model T on a beat Model A frame. Well at least he has a sponsor, so he's doing ok.
Quite a few guys would compete for fun of it, sponsor-less. But having a garage or business back you helped. As long as you could keep up with better teams, you could keep racing. He probably, minutes earlier, took the license plates and headlights off the car. And speaking of sponsors, here's one team that has it made! 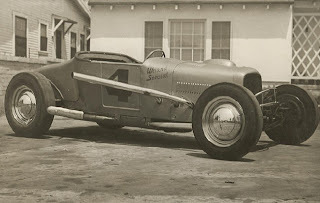 I see some expensive race parts on this very clean roadster, other then the new tires & paint, there are those pricey Kinmont early disk brakes. I don't know who Suds Sutherland is exactly, but he looks like a pro to me. It's hard to believe, but this type of car was high-end for the day. 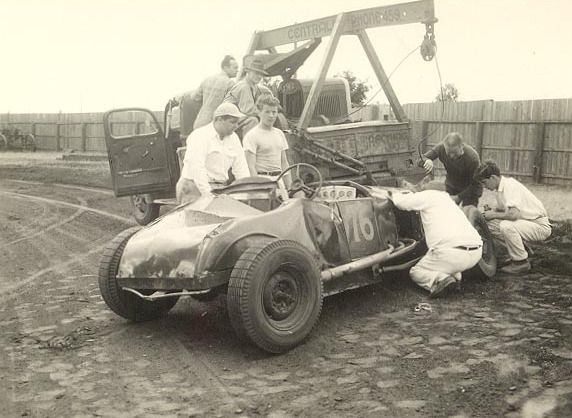 And many famous race car drivers who's name we are familiar with today came from humble race track this this one. Parsons, Rutherford, just to name a few. Here is another clean, purpose-build roadster. 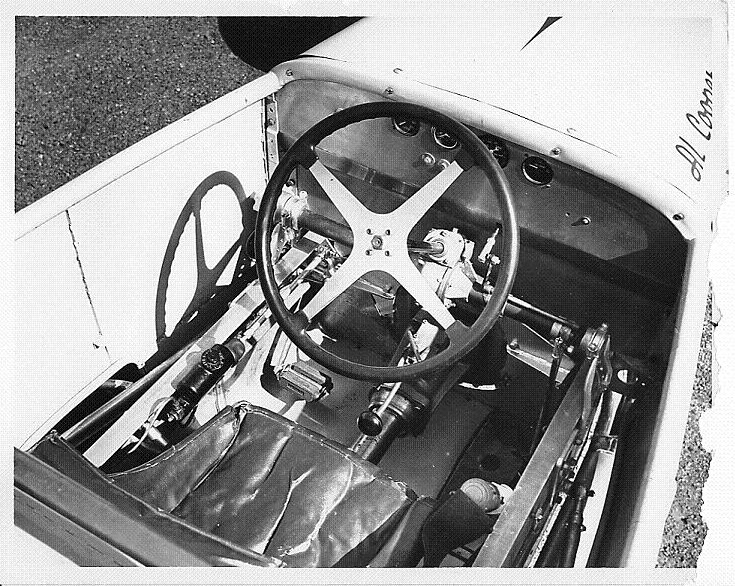 This car is particularly special to me, because there is a rare photo of it's interior (below). Here you can see the belly pan as the floor. Sparse safety equipment, only a seat belt and basic roll bar. I had to include one picture of a car that has many of the characteristics of the race cars above, but made for the street. I hope my car will be somewhere in between this and the cars above --leaning towards racier. 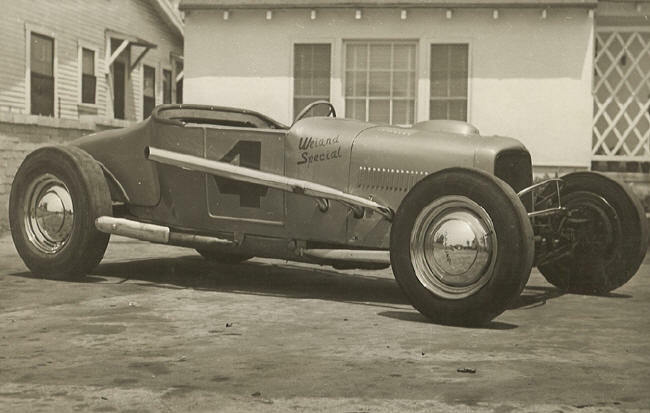 Although my car may never actually see a track I still want it to look like it could have been competitive in 1952. 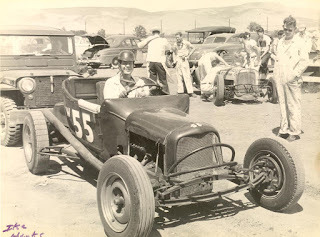 These are comments regarding your Dirt Track Roadster Inspiration page. 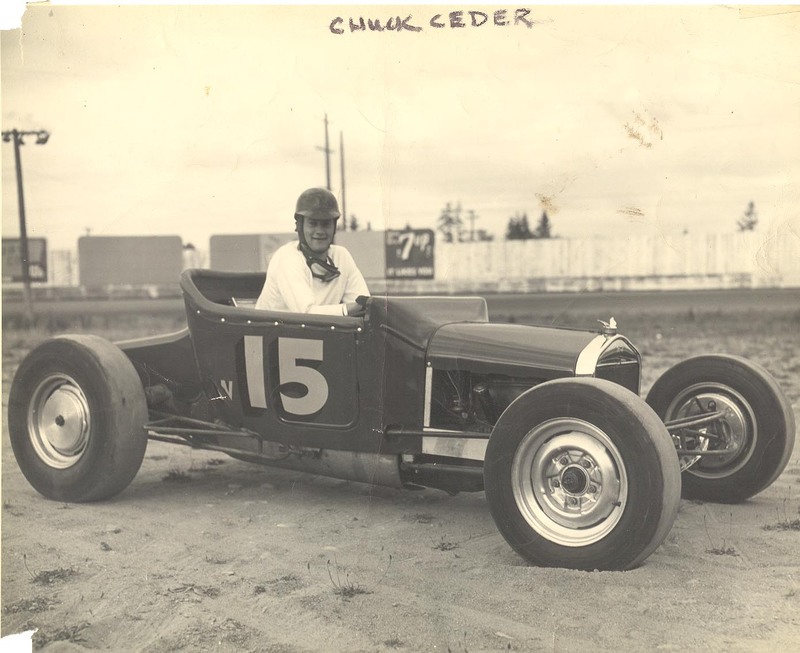 Number 55: this is a Seattle built car as I recall, built by Minor Pelly. 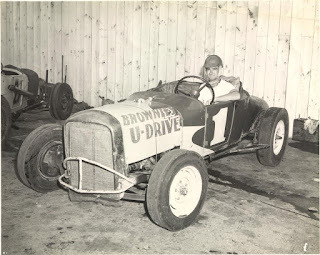 Over the years, several drivers drove this car. Ike Hanks and Pete Lovely were two that I recall. Johnny Ryason bought the car and campaign it for one year before he garaged that car at the insistence of his wife. It sat in his garage for 20 or more years before it was sold to a person in Oregon who restored it. When last I heard, it was street capable. Number eight was indeed driven by Dell Fanning who put it into the fence at the Aurora Speedway in Seattle, crippling him for the rest of his life. But that did not stop him driving for several more years. 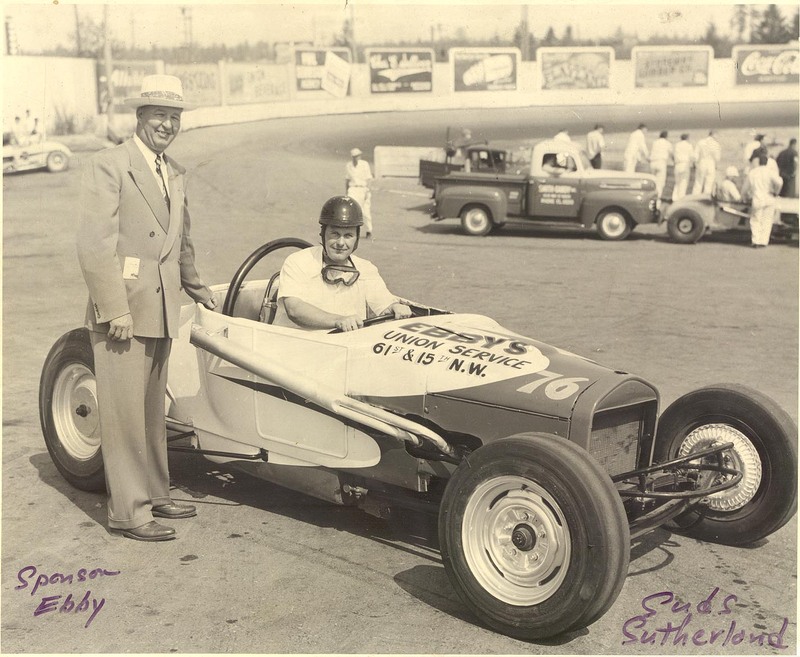 Number 76 Gordy “Suds” Sutherland was an engineer for the Great Northern Railroad and an extreme ham radio operator. 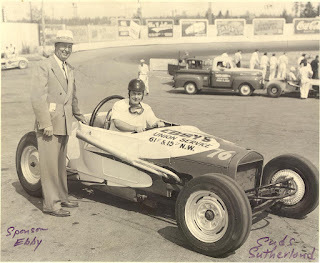 I believe the men standing alongside that car with a hat is Errol Herroux, owner promoter of the Aurora Speedway in Seattle. Number W-2 was owned and built by Bob Donker of Everett Washington. 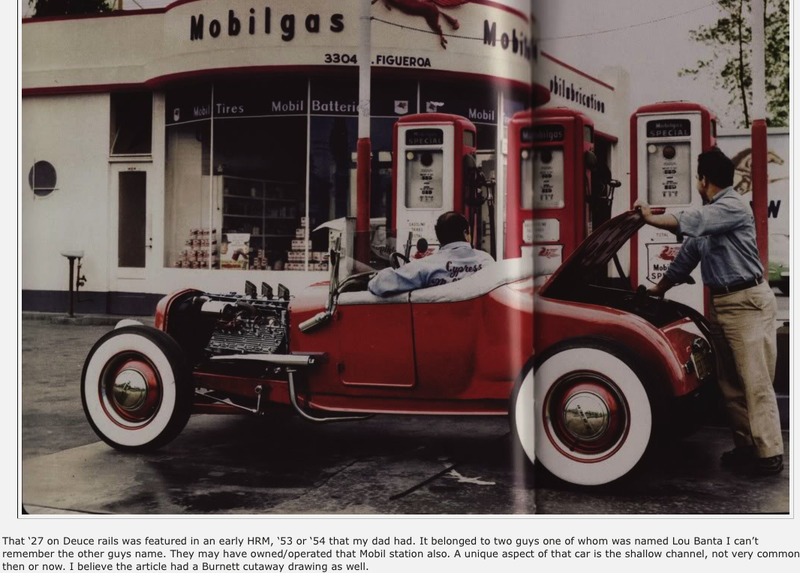 The car was featured in hot Rod Magazine. The car was so meticulously put together it was of show car caliber, unusual for track roadsters of that day. driver in Brownies U-Drive #1 is Art Scoville from Portland Oregon. Those photos really mean a lot to you, AJ. Indeed the history of it drives inspiration in you and your work. My Survivor on the H.A.M.B.